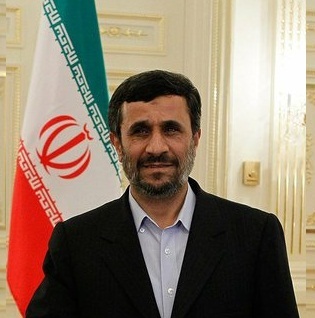 President Mahmoud Ahmadinejad has problems with Khamenei, supreme leader and former President of Iran. Ahmadinejad is a chosen politician, the official President in a strictly ruled theocracy in hostile relations with most countries. This post is about Mars-Neptune, Transit Saturn inconjunct Mars, signs of changing times for Ahmadinejad and about Jupiter-Sun and Eris in synastry. The news (link to Inside Iran) and the charts are corresponding. The Eris of Khameini is exactly inconjunct the natal Sun of Ahmadinejad and Khamenei's progressed Sun is opposition his Eris and semi sextile the natal Sun of Ahmadinejad. Time for some discord between them? Politics is complicated. The interaction between two persons is a complicated matter. There is much much more (international issues, family matters...) and a chart should always been seen in the light of circumstances and changing situations. With that in mind, continue for the charts, the transits and progressions and links to more about Ahmadinejad. Now that I write this blog, there is a poll on the right about Mars-Neptune. Mars-Neptune is the symbol of a range of things like 'using drugs', 'wrong action', 'criminal acts', 'idealist at work', 'negative drive' and 'passive aggression'. One thing is not in the list: religious or idealistic (Neptune)drive or conflict (Mars). Ahmadinejad has Mars sesquisquare Neptune (and quindecile Pluto). Mars is the funnel planet in the chart and is 'calling' (not making major aspects). Minor aspects are with Neptune (as I mentioned), Pluto (quindecile) and Saturn (75d). It means that he the theme of unnatural death and damage (or the force of ideology) will be important in this chart of a fighter, activist and warrior (an afflicted Mars is calling!). Mars-Saturn-Neptune-Pluto doesn't sound 'nice' at all. The chart of Ahmadinejad has Neptune rising before the Sun and Mars is calling. The sesquisquare of Mars and Neptune is an important one. The sesquisquare Mars-Neptune will be 'hit' by transit Saturn. End of August/early September Transit Saturn will be inconjunct his natal Mars. That is a nasty transit that leaves you without much energy in a dead end street. In some cases this transit simply means 'death' (not necessarily your own). Other reflections of Mars-Saturn: end of a job, hard conflicts. He has them and his opponent is Ali Khameini, the true leader behind the democratic screens. There are also signs of changing times: progressed Sun sign is changing, transit Uranus inconjunct Sun, Progressed Sun inconjunct Uranus and trine Pluto and transit Pholus square natal Sun. With more than 3 of such aspects, the chances of a big change are growing. 1. Ahmadinejad's Progressed Sun is changing sign. That means that his life or lifestyle is changing. 2. a There are 3 planets in the first degree of a sign in his natal chart: Pluto, Neptune and Uranus. There will be a trine with Pluto, a sextile with Neptune and finally an inconjunction with Uranus this year. Pluto and Uranus are symbols of change. Progressed Sun inconjunct Uranus is a statement for enstrangement, alienation, and change with a lost involved. 2. bTransit Uranus is inconjunct his natal Sun now. And that is two times Sun inconjunct Uranus! Upheaval and rebellion with a lost involved, two times? In the natal chart Sun is square Uranus, so this transit and this progression will be strong. 3. Pholus is almost exactly square the natal Sun of Ahmadinejad. Pholus is the symbol of the catalyst, the turning point and the centaur who shot himself in the foot. Transit Pholus is now semi square his important Neptune and square his natal Mars. That means that Mars-Neptune is being 'hit' by Saturn and Pholus. Saturn-Pholus is the combination of the nasty turning point. But, right now transit Jupiter is opposition his Sun and he may enjoy some protection, still. He just found economic allies in Pakistan and Afghanistan (http://english.farsnews.com/newstext.php?nn=9003260234) and that is success. Jupiter is inconjunct the progressed Sun of Khamenei. So they share this opportunity. Khamenei was born July 17, 1938, says Wikipedia. This is the chart for noon on that day with transits and progressions for now. Khamenei has Mars on the midpoint Sun/Pluto, 50% in water signs (including Sun and Moon) and Uranus rises before his Sun. With Sun, Mars and Pluto in conjunction, too, he is the 'strong man' and Saturn/Pluto conjunct Sun mirrors the 'die hard'. Such a combination in a country like Iran also shows the danger of making enemies. In 1981an attack paralyzed his right arm. Right now Khamenei has Progressed Sun opposition Eris, the symbol of discord. Transit Uranus is opposition Progressed Sun, too. So, there is a sudden discord changing his life and lifestyle. Just like the President, he has a Jupiter transit: Transit Jupiter is inconjunct his progressed Sun (reflecting a success with a loss involved). Is there a nice side on Mr. Ahmadinejad? Hardly. He is not the kind of guy to choose the easy way out (not enough soft aspects). He doesn't have many doubts (no oppositions). There are conjunctions and (semi-)squares with the personal planets and that looks like joined forces ready to fight. This made him a President in a macho country. Venus conjunct Jupiter is the combination of social success, parties, the generous one and of being loved. He may be an outsider (Sun square Uranus), he may be very aggressive and angry (Mars-Pluto quindecile), but a sufficient number of people voted for him and support him, maybe because they see these strong characteristics as a quality. He might be very nice and generous to those who love and support him. And he might be a big spender, too:).